With ds turning 3 years old today and dh doing another triathlon on Sunday, our weekend was thrown into a complete tailspin. So, when I texted dh a few days ago (while he was 2000mi away for work) and said, “I want the veggie box this week!” I think he thought I was out of my not-locally-grown gourd. I tried swaying him with the enticements of “Melon” (no specificity, just MELON), blueberries, the ever-delectable cherry tomatoes, etc., and he just wasn’t having it. He was meh all the way, mostly because he was afraid that we wouldn’t go through it. Then I said, “but we’re going to get CORN!” (and we really LOVE the sweet corn from our farm). Again, the meh, followed this time by his insistence that we won’t be eating it right away since our family tradition is to have my parents over on the Friday night of the weekend when they’re visiting and order take-out from our local, truly wonderful, Chinese joint right up the street. “AHA!”, I said. “LET’S GRILL THE CORN! !” I could hear the shrugging over SMS, but he relented, and thus was born what I’m terming a weekend challenge: I’d like to see just how much of the veggie box we can go through in one weekend, given that we’re having company over for a birthday party. Thankfully, this week’s box is packed with things that are well-loved in our household. And, since I already had my heart set on getting that corn grilled, I now have a good use for the cucumbers. FINALLY. My sister also has some cukes, from her own garden, and she’s whipping up a batch of tzadziki to share with everyone. Since dh & I both love Greek food, this should make for a nice accompaniment to the salad I’m going to whip up (the recipe will be shared later, assuming it comes out tasty). Purple potatoes AND a purple pepper…?! AWESOME! As of writing this post, I have not yet cut into “Melon” but once I have, I will try to ID it and be specific in terms of pricing it out. All I know is that the skin has an orangish hue that suggests canteloupe, but its size and skin texture don’t really match, so “Melon” is a bit of an enigma to me right now. Since I also picked up some grapes from the farm (grown in the trellises that hang over one of the walkways into the farmstand), I’m probably going to make up a fruit plate or fruit salad. These grapes don’t taste like regular ones from the grocery store and I can’t for the life of me come up with a suitable comparison. And so this is where the “value” of the purchasing from the farm versus the grocery store just can’t capture the true value of buying higher-quality produce. As I discussed with my mother last night, I know we’re lucky, living in a town with both a working farm AND a working dairy, so I realize what I have isn’t available to everyone. I lament that somewhat, but hopefully those who are interested will at least dip a toe in the water by finding a regional farm, farmer’s market, or some other means of getting fresher, local produce. The quality difference can be really immense, before you even get to the additional benefits of lessened environmental impact, heightened boost for the local economy, etc. So, back to the idea of using as much of it as possible in one weekend…I think it’s fairly likely we can do it. The Melon, blueberries, and grapes will end up as part of some kind of fruit salad or assortment. The corn is planned to go on the grill and end up in a salad with cherry tomatoes and cucumbers. The sweet peppers be sliced and go out on the table to be demolished quickly by the kids (who will each go through an entire pepper in a single sitting, if you let them). Really, the only thing likely to make it through the weekend is the potatoes, since we still have some purple potatoes left over from a prior veggie box. Should the weather head south, I can always make a metric ton of purple potato chips for everybody. I’d hate to heat the house like that, running the oven in the middle of August, but I’m not above it if the weather isn’t conducive to grilling dinner. Again, fingers crossed. 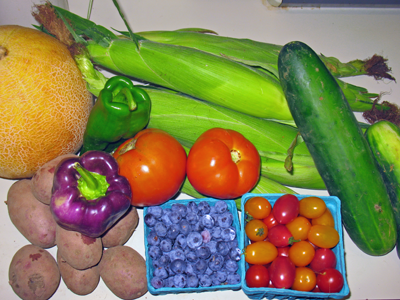 This entry was posted in locavore and tagged eat local, fruit, locavore, vegan, vegetables, vegetarian by crunchymetromom. Bookmark the permalink. Is it a hybrid melon? We’ve been getting melons that are a cross between a cantaloupe and honeydew in my food co-op. The most recent was a Galia melon, looks like a cantaloupe on the outside, but green on the inside like a honeydew. Either way, it’s melon and it’s delicious! Honestly, I’m not sure which melon it was…lighter in color than a cantaloupe, with a slightly milder (yet still very sweet) flavor. Maybe casaba? Definitely NOT honeydew; the flesh wasn’t even mildly green. It was more like a light peachy color, in between a white and a standard orangy-cantaloupe color.